“Is that a… laptop?” the waitress at a diner near where I live asked (I had taken the Lenovo Yoga 900s with me to get some work done). “Sort of!” I said, quickly bending the screen around to demonstrate the Yoga line’s defining feature: the watchband hinge that converts the device from an ultra-thin laptop to a tablet. The waitress looked on in horror. But as I discovered with the Yoga, a backflipping screen can be a lot of fun when done this well. It would be a worthy gimmick if that’s all it was, and more than enough reviews have drooled over that watchband hinge of the Yoga line. The trick with the Yoga 900s, however, is that not only does it work well, but Lenovo managed to stuff enough goodies into the 0.5-inch (12mm) shell (the thinnest yet from a Yoga) to make the 900s a joy to use even after folding it in half becomes boring. Over the course of the week that I used the new 900s, it proved itself an excellent travel laptop. It’s thin enough to fit into any backpack or messenger bag, and light enough to barely register as added weight — something that wasn’t the case with previous Yogas. It also has enough battery life to keep you from scrambling for a wall outlet. At just shy of a kilo in weight, it’s amazing the battery lasted six hours at full brightness streaming videos online. Having the tablet mode available also made it an appealing choice for reading comics. 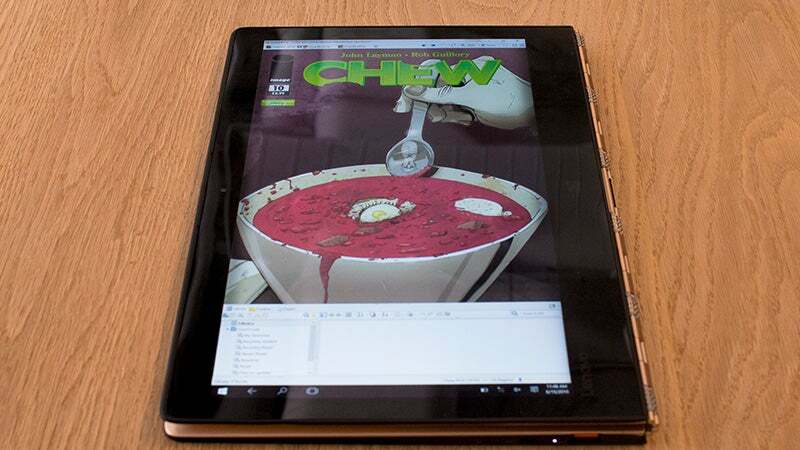 A dozen or so issues of John Layman’s Chew later and I was convinced. This isn’t like other, thicker and clunkier convertible laptops. The 900s has become my go-to companion for shovelling books, comics, and film into my head while stuck on the train. It was pretty good at guessing whether it was in laptop, tablet, stand, or tent mode (though personally I never found a good reason to use either of the latter two configurations.) Unfortunately, the screen isn’t terribly bright, which makes those activities difficult or impossible outdoors. There are a few other minor annoyances. 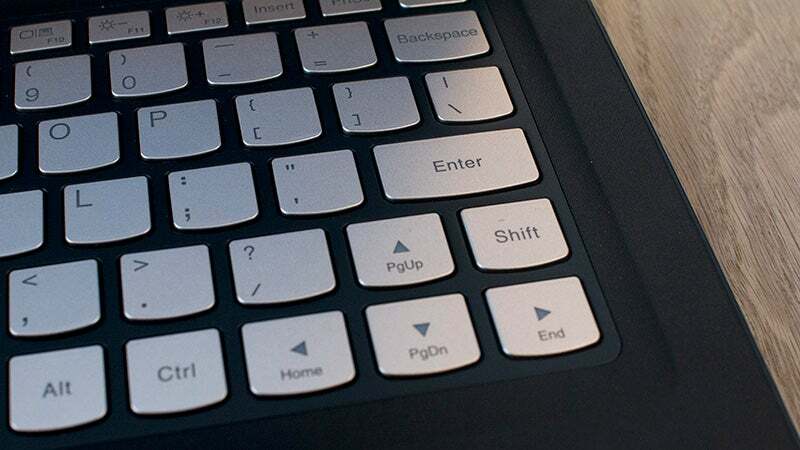 Windows laptops tend to have shoddy trackpads and though the Yoga is better than most, it’s so small that I often preferred using the touchscreen. However, any program running fullscreen runs into the touchscreen’s only issue: the edges are terribly insensitive. Also, no one should have expectations that a 12-mil-thick inch laptop will have incredible speakers, but placing them on the underside of the chassis is just plain stupid considering the screen is designed to move into a position that badly muffles the sound coming out of them. The Lenovo Yoga 900s isn’t a laptop for gaming, video editing, or anything else CPU- or GPU-intensive; it’s got a Core M processor best suited for consuming instead of creating. And for that reason some might consider the cost on the 900s to be a major drawback. At £1,000 it’s roughly the same price as a MacBook or a similarly sized iPad and just a bit heavier than the latter, but with a full keyboard, maybe a bit more battery life, and, eventually, far fewer screen scratches. And you can gloat knowing that if Apple ever does put out a fully convertible laptop, it would probably retail for far more than what Lenovo is charging.